M&S have one hell of a sparkler on their shelves at the moment. 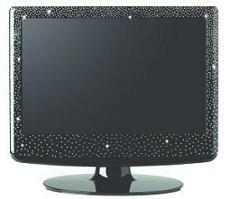 This limited edition 19-inch beauty has been given the star treatment with over 500 crystallised Swarovski element crystals to give it a glistening outer coat. Underneath all that bling is an HD ready LCD TV, with an integrated DVD player and Freeview receiver – so no extra boxes necessary. Expect high definition viewing, Nicam stereo, 500:1 contrast ratio, 8ms response time, and an energy efficient remote control with a full power off button, eradicating the need to waste energy while your TV sits dormant in standby mode. Being limited edition, there are only 1000 available nationwide, which if you do the math, doesn’t leave many sets in each store when you think about the plague high level of M&S stores up and down the country. So if it takes your fancy, get you skates on and have £399 ready for payment too.